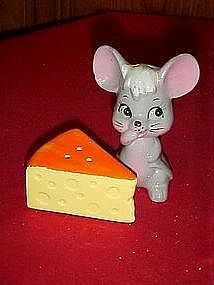 Adorable little mouse is thinking of sampleing this piece of cheese! Made of hand painted glazed ceramic with cold paint accents. Mouse measures 3 1/2" tall. Both pieces are in wonderful condition. There are no stoppers for these. If you collect mice these are nice!